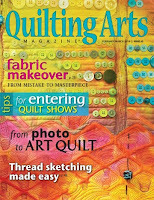 My first column on thread sketching is in the February/March 2010 issue of Quilting Arts magazine, which is hitting mailboxes now. Throughout 2010, I’ll be writing about using thread to add color, dimension, texture, line, pattern and movement to the surface of an art quilt. The first installment focuses on adding color with thread. 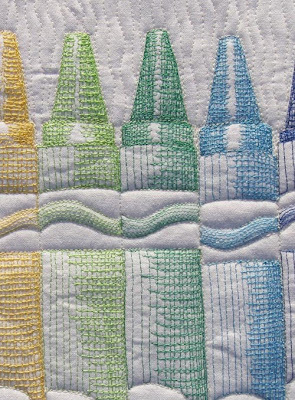 Thread sketching is something I discuss in my Quilting Arts Workshop DVD, “Master Machine Quilting: Free-motion Stitching and Thread Sketching,” but in the column, I’ll go provide lots more tips, go into more detail, and teach how to get great results through exercises and practice. Congrats to Susan for being featured in the preview for Quilting Arts next video series.